We study decision problems for parameterized verification of a formal model of ad hoc networks. We consider a model in which the network is composed of a set of processes connected to each other through a directed acyclic graph. Vertices of the graph represent states of individual processes. Adjacent vertices represent single-hop neighbors. The processes are finite-state machines with local and synchronized broadcast transitions. Reception of a broadcast is restricted to the immediate neighbors of the sender process. The underlying connectivity graph constrains communication pattern to only one direction. This allows to model typical communication patterns where data is propagated from a set of central nodes to the rest of the network, or alternatively collected in the other direction. 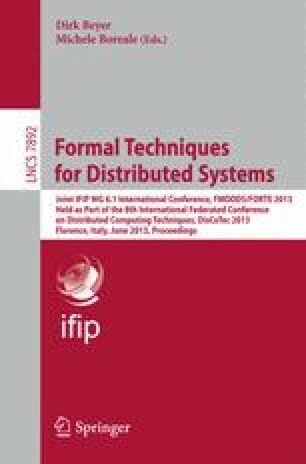 For this model, we consider decidability of the control state reachability (coverability) problem, defined over two classes of architectures, namely the class of all acyclic networks (for which we show undecidability) and that of acyclic networks with a bounded depth (for which we show decidability). The decision problems are parameterized both by the size and by the topology of the underlying network.